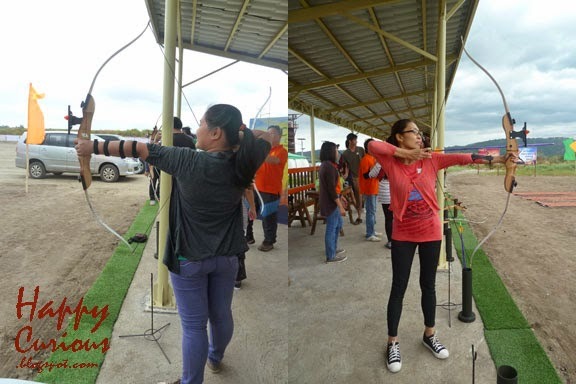 We experienced some mild, but challenging exercise on a cold, Sunday morning courtesy of the newly launched Outdoor Archery at SandBox in Alviera. Meetup time for this event was at 7AM and on a Sunday too! But I've always wanted to try my hand at a bow and some arrows so I dragged my cousin along for this opportunity. The first time we visited the SandBox was during its opening and then it was warm and very sunny. But today, it was chilly and windy so we were told to wear long sleeves and sneakers and avoid billowy clothes. I thought this was just the right gear for the weather and for some casual archery. Upon arriving, we first had to register and of course to sign the waiver. Then off we went for the official launch of the Outdoor Archery. 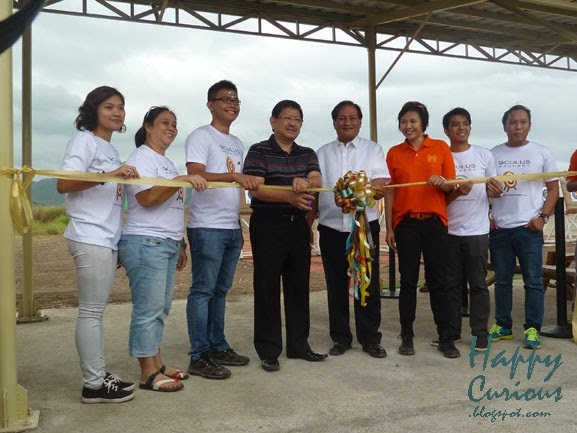 Guests were welcomed by Ms. Krizia Chu-Tanquilino, Oculus Archery owner, SandBox in Alviera's partner in this new, fun addition to its attractions. Hon. Mayor Condralito dela Cruz also gave a message of appreciation for the management, partner and guests. 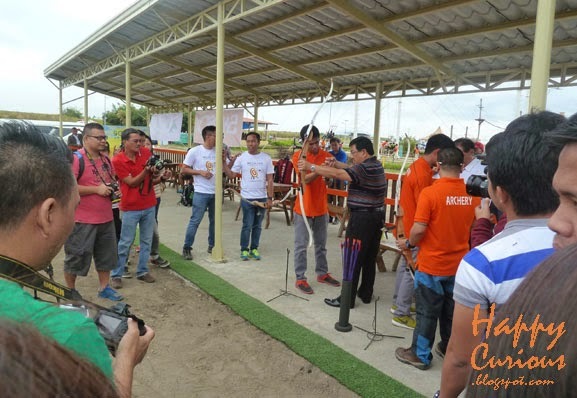 The ribbon cutting ceremony followed to officially launch the Outdoor Archery to media and guests. The speakers also participated in an Inaugural Shoot to try out the facility themselves. 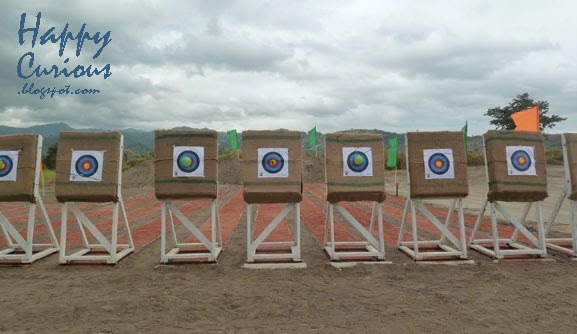 It was then the media and guest's turn to try our hand at the archery range. We we're called by batches of 12. Me and my cousin were on the 2nd batch and were pretty excited as we waited our turn. Archery may not look like a very active sport but I think it is more fun than golf but requires the same effort to concentrate. 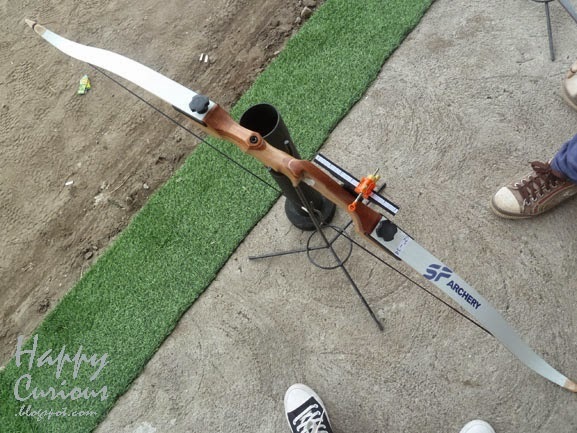 "Archery is a great sport that perfectly fits the outdoor and fun character of SandBox at Alviera. It’s an activity that does not look at the height or build of an archer. It develops one’s ability to concentrate and focus, and also develops endurance and self-discipline. One can play it alone or enjoy with family and friends as a team sport. When played in an outdoor range like Sandbox, archery can be more fun and challenging with factors like the wind and sun glare to consider. In competitions, targets in the outdoors are also bigger but placed farther away. 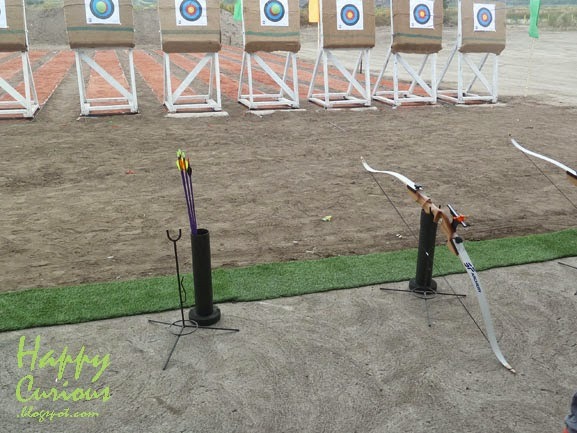 Archery is an exciting outdoor activity that we have opened to guests aged 7 years old and above." Also, there is no age limit. The are beginners who are taking up the sport even at the age of 60. It also requires a lot of physical strength as we soon found out when it was our turn to get our hands on a bow and arrows. The wind was very strong that morning so that the orange and green flags in the distance were fluttering like crazy. The archery staff had placed balloons to the targets and I was so eager that I actually popped the balloon on my target at the first try. The bows we were provided were actually very light ones (14 lbs) but it was a challenge to stretch it at first and our arms were shaking more from the effort of pulling than from the cold. After a few times of practice at aiming, I already felt warmer. This activity not only takes arm strength, it also engages your core as you have to maintain your posture and keep arms straight and steady as you aim. Isn't that great? You're exercising and burning calories and all you're doing is standing up straight and keeping a steady aim. The archery staff were all expert instructors and were very good at telling and showing us what to do and how to do things properly. One tip that helped was to shoot as soon as you have your aim and not wait too long as your aim will slightly change direction. 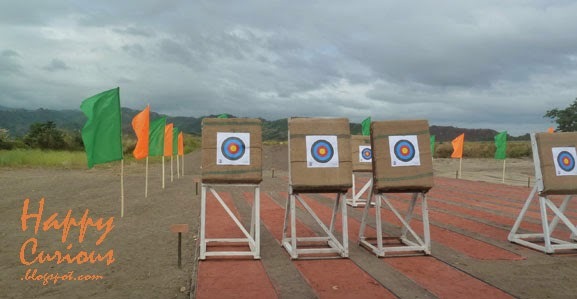 Safety was also observed as no one was allowed to go retrieve their arrows while some participants were still trying to shoot their arrows. We were also equipped with arm guards to prevent from getting bruises in case the bow string struck us on the aiming arm. I only experienced the pain of this on my last arrow. They also had a contest for participants where a prize was given to the first one who can pop their balloon on the final shoot. When this was announced, my first thought was, "Why didn't they announce this at the beginning when I had successfully popped my balloon?" I did not win but there was a winner from among our batch. "Visitors can choose from a 30-minute (P250) or a 1-hour session (P400). Both packages include basic coaching, bow, as many arrows one can shoot within their timeslot, gear (quiver, chest guard, arm guard) and one balloon target. There are options for novelty targets as well." Aside from the Outdoor Archery, updates on some of SandBox facilities include the Aerial Walk which before had 17 activities but now "offers 28 activities with the addition of new tunnels, loops, beams, nets, and ziplines." Guest can continue to enjoy their favorites such as the Giant Swing, Adventure Tower which houses wall climbing, rappeling and free fall as well as Avatar One, the first roller coaster zipline in Asia. There's also ATV and mini-ATV rides, biking, kiddie playground, picnic areas, mini-golf and an open field for other outdoor activities. For our firsthand experience on some of these other fun facilities, read the previous post here. SandBox at Alviera is open from Tuesdays to Sundays, 9:00 AM to 5:00 PM. For booking guidelines, visit the Alviera webpage at www.alviera.ph and on Facebook, Instagram, and Twitter at AlvieraPh. All quotes are from the press release documents provided during the inaugural event (February 1, 2015). Hi there! I could have sworn I’ve been to this site before but after going through some of the posts I realized it’s new to me. Anyways, I’m definitely happy I found it and I’ll be bookmarking it and checking back regularly!